The Kremlin's "dirty scenarios" will fail, she added. Despite various attempts to push Ukraine to legitimise Donbas militants, it will neither bow nor hold direct negotiations with them, Ukraine's humanitarian envoy to the trilateral contact group on a Donbas settlement, deputy speaker Iryna Herashchenko has said. "Ukraine is being pushed by various forces to legitimise militants and hold direct talks with representatives of certain areas of Donetsk and Luhansk regions, thus trying to create scenarios of direct negotiations going in parallel lines to the Minsk process, without the Russian Federation and the OSCE," she said on Facebook. 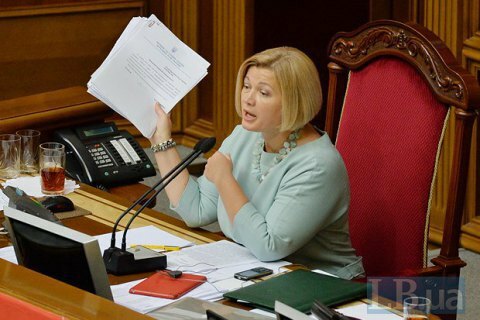 She added that these efforts "seriously complicate the already difficult work of the Ukrainian delegation in Minsk." "But there will be no direct negotiations and no legitimisation of militants," Herashchenko said, "whatever dirty scenarios the Kremlin plays in this hybrid war against Ukraine." She added that this position is shared by the president, the government and all "sound forces" in the Ukrainian parliament.